Yarn Nook: We have a winner!!!! Well....actually we have 2 winners......for our Name That Sheep Contest!!! 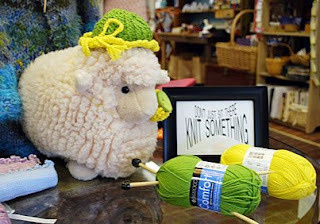 The Yarn Nookers voted on the best name for our sheep friend last Wednesday, and we actually picked first and last names that were submitted by two different people and combined them to form our sheep's name. So, two of our creative friends will receive a skein of Happy sock yarn of their choice as a token of our appreciation for helping us to come up with such a great name!!! Dean came up with Ewenida as a first name, and Erin came up with Knitmore as the last name. Isn't it great?!?! Thank you so much, Erin and Dean, for sharing your creativity with us, and we can't wait to see what you do with your new yarn! Hats off to all of you who submitted names for our sheep.....you came up with some great ideas!!! !